(Rick Egan | Tribune file photo) The Mormon Tabernacle Choir sings in the Saturday morning session of the188th Annual General Conference in Salt Lake City, Saturday, March 31, 2018. After Thursday’s announcement that “Mormon” and “LDS” are no longer acceptable nicknames for The Church of Jesus Christ of Latter-day Saints and its members — and that its formal title and other polysyllabic variants are preferred — the initial reaction on social media was one of surprise and amusement. 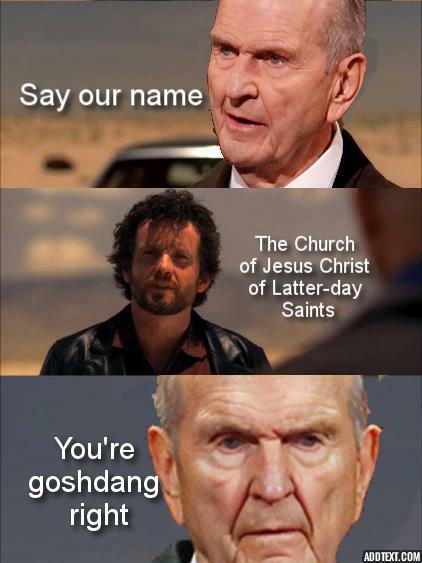 August 2018: The Prophet stresses the importance of the name The Church of Jesus Christ of Latter-day Saints. The ground was prepared brothers and sisters! By Friday, the joking posts and memes — of which there are many, many, examples online — were sharing space with questions about how best to follow the new guidance from church leadership. Many practicing Latter-day Saints — the preferred moniker instead of “Mormons” for members — and faith-promoting accounts took to Twitter to parse the practical realities and effects of moving away from shorthand phrases that have come to define the Utah-based religion for generations. Jennifer Scott, a communications professional who previously worked on the staff of former Rep. Jason Chaffetz, R-Utah, suggested that the changes were meant for news organizations and other formal descriptions of the LDS Church, and not for use in the everyday, casual conversations of rank-and-file church members. This is just a style guide change for media references though. I see no demand that people change the way they personally refer to the Church. Perhaps supporting Scott’s argument is the official Twitter account for The Church of Jesus Christ of Latter-day Saints, which continues to use the handle @LDSchurch despite this week’s changes to its style guide, which now discourages use of the LDS acronym. The church’s announcement, attributed to President Russell M. Nelson, stated that additional information on the changes will be forthcoming. And church spokesman Eric Hawkins was unable to provide clarification or elaboration Thursday on some specific church-produced titles and groups — such as the Mormon Tabernacle Choir — that use the “LDS” and “Mormon” descriptors. Doug Wilks, editor of the church-owned Deseret News, told The Tribune on Thursday that his staff will respect the church’s right to self-identify. And News reporter Tad Walch, who covers the faith, posted on Twitter that he will need to review the phrases he regularly uses to describe the faith. No kidding! LOL. This will change some of the very basic phrases I use in writing about the church, too. Other Twitter users emphasized the church’s request that, after being identified by its full name, it subsequently be described as “the church," “the Church of Jesus Christ” or “the restored Church of Jesus Christ.” A component of the faith’s doctrine is the belief that The Church of Jesus Christ of Latter-day Saints is the literal restored gospel of Jesus Christ. The Church of Jesus Christ of Latter-day Saints is a good title for the Lord’s church because it puts The Saviour at the centre. My focus will be on actually putting Him at the centre of my own life and worry about my twitter handle later.